Babaduck: Is Food Shopping in France a Bargain? Mais Non! Possibly, but it mightn't be the greatest quality. You can get vin de table in a supermarket for about €1.50 a bottle, but you can equally get a bottle of wine here for €6.00. The 6 for 1 equation is pretty misleading. When I'm in France, my wine costs me from €2 a bottle, depending on what's on offer and the average cost is about €2.90. You have to remember that we pay a lot more tax on alcohol in Ireland, hence the higher prices. Tosh. A 5 litre bottle of own label water in France is €1.09. The same size bottle here is €1.29. Certainly if you stick to French branded water like Evian you will see a difference as it's a local product in France and imported here which naturally increases the price. But €3.49 -v- €4.99 still isn't a multiple of four. Naaah. In France, a 6 pack of standard 2-finger Twix bars (300g) are €2.73. In Ireland, there isn't an exact equivalent product but a 16 pack of single Twix bars (368g) is €2.69. This is a bit of a grey area. 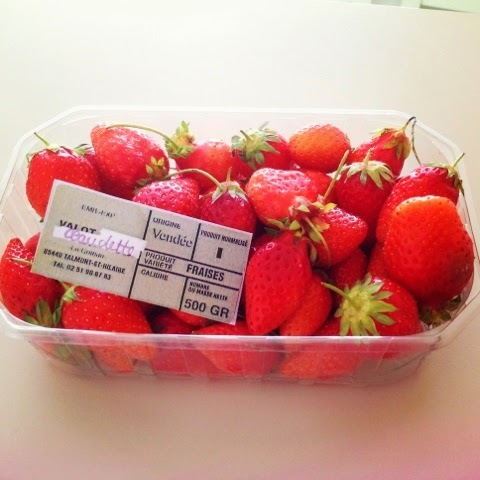 The cheapest strawberries in France are Spanish imports which are about €3.38 per kilo, very cheap indeed. But if we compare like with like, French strawberries are €3.99 for 500g and Irish strawberries are €4.50 for 450g. And if you want to be precious about your fruit in France, Gariguette or Ciflorette varieties are almost €6.00 per 500g. Absolutely 100% true - especially in the case of spirits. a 70cl bottle of vodka is €9.89 in France and €12.99 in Ireland. A 70cl bottle of Gordons Gin is €14.80 in France and €23.99 in Ireland. To rub it in, a bottle of Jameson is €19.89 in France but €26.00 here. Zut alors! So, booze is cheaper but most other things pan out at roughly the same cost. Not as headline grabbing now, is it? Nice blog and a great topic. I'm just back from 2 weeks in Paris/Loire and totally agree that prices are equivalent to here, maybe a little pricier on some items, and definitely cheaper on the booze front. Overall, I found France a little pricier lifestyle wise, maybe 5% so. The big difference is quality. I shopped in the neighbourhood branch of Super U in Salbris, a small town, the size of Delgany. The town has a Carrefour and a Super U. The Super U is about the size of Dunnes in Blanchardstown, in other words, pretty big for a town of 5000 people. It's not really a tourist town, nearly 20 km from the nearest big campsite. The range of products, quality of fruit and veg, mainly local and fresh, excellent breads, patisserie, tanks of fresh lobsters, all sorts of meats, hams, huge range of cheeses...I mean, no it's not cheaper but it's about a million times better than here. To get that range of products at that quality level, I'd be shopping in a number of specialty shops here and a farmer's market and then I'd definitely be paying more than the equivalent quality in France.